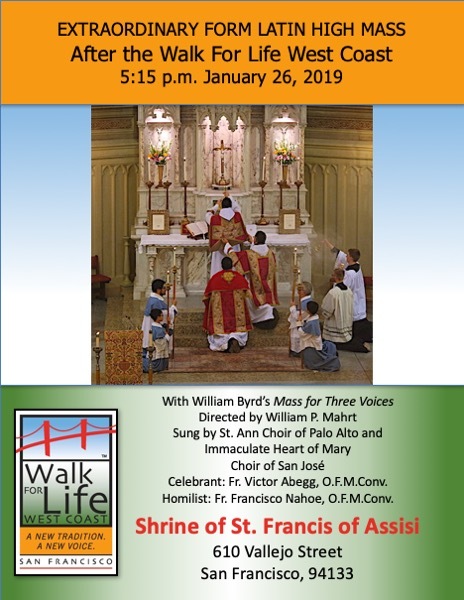 People who will be in San Francisco for the Walk for Life West Coast on January 26 will have two choices to attend an Extraordinary Form High Mass. 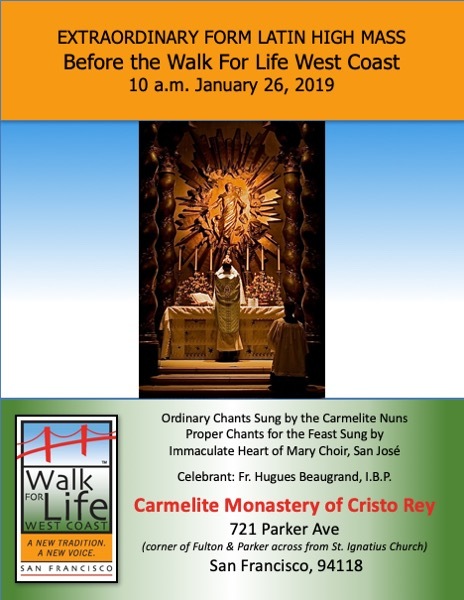 The first will be celebrated before the walk at Cristo Rey Carmelite Monastery at 10 a.m., located at 721 Parker Avenue in San Francisco; the Carmelite nuns will sing the Ordinary chants and the Immaculate Heart of Mary Oratory Choir will sing the propers for the feast of St Polycarp. The second will be celebrated after the walk at the historic Shrine of St Francis of Assisi in North Beach, (610 Vallejo Street, San Francisco) at 5:15 p.m. Under the direction of Professor William Mahrt, the St Ann Choir and the Immaculate Heart of Mary Choir will sing William Byrd’s Mass for Three Voices. This Mass is always especially well-attended. In addition, Archbishop Cordileone will celebrate an Ordinary Form Mass for Life at the Cathedral of St Mary at 9:30 a.m. at which he will impart a Papal Blessing to those who attend that Mass. The Vatican has also granted a plenary indulgence for those who participate in any of these Masses offered on the day of the Walk for Life West Coast; those who are sick and infirm may obtain the indulgence by joining to the Masses spiritually or via media. The Mass for Life will be broadcast from the cathedral on the Archdiocese website, sfarch.org.